Born in Athens in 1964. He is a qualified artist from the National Archaeological Museum and the Department of Culture, creating excellent quality copies from all periods. For his specialisation in painting, he studied at the workshop of N. Kansali, as well as at a private school for art restoration.From 1990 until today, he has a workshop where he specialises in creating religious paintings, designing and decorating faithful copies of ancient Greek art. 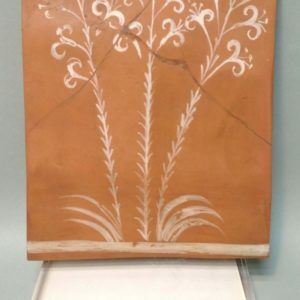 In 2003-2004, in a Pan-Hellenic Public Competition of the Ministry of Culture for the production of authentic copies, he qualified first in the production of ceramic copies, judged by a large committee of distinguished scientists and the CAC. Therefore, he is the only painter with the official certification of the Ministry of Culture. With his Masters degree in ancient iconography he had the chance to study under the eminent Io Zervoudaki and Betty Stasinopoulou. He owes a lot to the Sculpture Collection of the National Archaeological Museum and to a multitude of Directors and archaeologists of museums and archives of antiquities who believe in and support his work. He continuously studies pottery and urns, mainly in the premises of the National Archaeological Museum, the Museum of Elefsina and several archaeological sites. Lastly he is also interested in the study of Hellenistic vases, a fact which he owes to Professor Stella Drougou. Since 1997 he has collaborated and continues to do so, with many museums, cultural institutions and organizations both in Greece and abroad (the Acropolis Museum, TAPA, OPAP, the Metropolitan Museum of New York, etc.). His creations have been exhibited alongside original projects in the framework of international exhibitions of archaeological interest. His dynamic presence in a number of domestic and foreign exhibitions continues with great success until today. In addition, from 2002 up to the present time, his work has been exhibited at the TAPA (Archaeological Resources & Exploitation Fund) store, the National Archaeological Museum, the Museum of Cycladic Art and the Organization for the Promotion of Greek Culture.